We are a leading Manufacturer of fbd inflatable gaskets from Ahmedabad, India. FBD Inflatable Gaskets (Silicone And Neoprene) works like a cycle tube. When inflated, it seals the bowl and safe guard proper sealing. It is being made up of Neoprene Rubber / Transparent Silicone Rubber. When a pressure of 4 kg is enforced in Silicone rubber and 2 kg in case of Neoprene rubber, these gaskets are inflated by 6-10 mm. 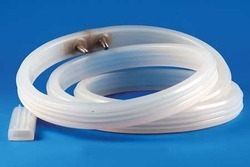 Looking for FBD Inflatable Gaskets ?